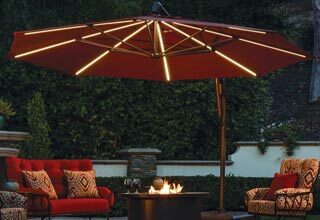 Patio Place sells and delivers competitively priced patio furniture, umbrellas, barbecues, bar stools, gas logs, fire pits, protective covers, fire tables, and more. We have served Laguna Beach and nearby communities since 1989 and pride ourselves on securing the best prices in Orange County from top brands, including, NorthCape, Fire Magic, Ratana, Sunset West, Treasure Garden, Patio Renaissance, and Hanamint. With our combination of superior-quality merchandise at heavily discounted prices, our family owned business has outfitted thousands of patios, poolsides, gardens, decks, and other outdoor spaces in Laguna Beach and beyond. If you're looking to revitalize your existing patio furniture, we affordably restore and repair old, worn, broken, and weathered patio furniture and patio umbrellas in Laguna Beach. 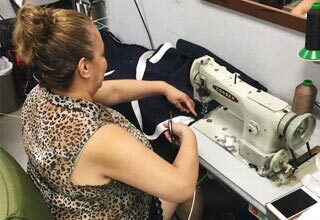 Related services include outdoor furniture frame refinishing, custom fabricating replacement outdoor cushions and pillows, custom making replacement slings, and replacing umbrella ribs, as well as recovering, silkscreening, and restringing patio umbrellas. For everything we do, we prioritize your complete satisfaction. We take the time to listen to your needs and offer honest recommendations to suit your tastes and fit your budget in Laguna Beach. We welcome any and all questions, and offer convenient, same-day delivery service for most of our inventory. We are conveniently located near Laguna Beach in Costa Mesa, at 845 Baker Street. Visit us today to learn more. We feature gorgeous single pieces as well as sets, and our inventory includes a number of well-known brand names, such as Sunset West, Patio Renaissance. Our patio furniture comes in beautiful wicker, extruded aluminum, and cast aluminum styles, and can be paired with gorgeous, custom-made outdoor cushions, made in-house by our skilled fabrication team. Visit us today, and be sure to ask about our custom-made protective covers, which will keep your outdoor furniture looking new for years to come. 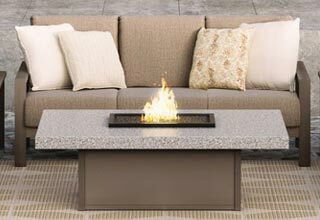 We also stock common fire pit accessories, such as ceramic gas logs, reflective fire glass, and decorative domes, not to mention our wide selection of durable bar stools in attractive styles. Call today and ask about our convenient same-day delivery service for Laguna Beach. We also sell a full range of umbrella lights and umbrella bases, and can customize your umbrella with silk screened logos or business names. Moreover, we can repair residential and commercial patio umbrellas by restringing them, recovering them, or replacing ribs. Call us today and learn more about our gas-line hook up, barbecues parts replacement, and propane-to-gas (and vice versa) barbecues conversion services for Laguna Beach. 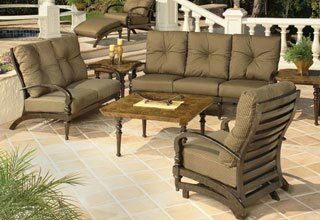 We recently purchased a Tuscany style patio furniture set from Patio Place and we love it!! You can tell right away that their products are made of quality materials. They can also custom make everything to your liking! Can't wait to finally be able to host our dinner parties in the garden. I also wanted to mention that the customer service at the store was very pleasant, accommodating and we felt welcomed as soon as we walked into their store. They have catalogs and brochures to look through showing many various options of the furniture offered along with many different designs/colors of the different fabrics.